So, you think you’re ready to compete in a martial arts competition? First, you should consult with your instructor to ensure they are comfortable with your abilities to compete. You must also need to make sure you fall into a specific weight class for the competition. 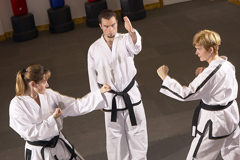 To read more about preparing for competitions, visit http://www.fitnesshealth101.com/fitness/general/sports/martial-arts. Entering a tournament can be fun. You are done all of your practicing, and it’s time to show off your skills. Entering tournaments helps you sharpen your skills, put your skills to use outside of the classroom and make new friends. Competition allows you to experience a new level of martial arts, seeing a variety of skill and experience levels. Competition is also good for you to help you become a stronger competitor –– win or lose. Read more about the benefits of martial arts tournament at http://www.urbandojo.com/2010/08/10/competing-in-a-karate-tournament-5-reasons-to-try-it-out/.